I’ve known David Eagleman for more than 30 years. For those who aren’t familiar with David, here’s a link to his home page. What’s fascinating about David is how he has managed to bring an element of entertainment to what otherwise might be considered a rather mundane topic – neuroscience. But by tying the science to the real world, David bridges the gap. He covers his complex topic in an easily understood and digestible manner. David recently relocated from Houston to Silicon Valley to teach at Stanford and continue his ventures in the private sector. I suspect that we will see more great things from David Eagleman in the next few years. Keep your eye out. 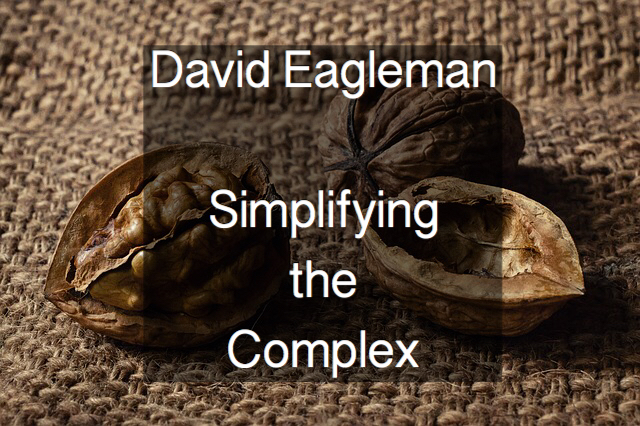 Readers, are there other individuals you know who have an ability to simplify the complicated? To entertain while they inform. I’ll check out Scott’s site. Agree. I really enjoy the TED talks as well. There’s been one person who’s been able to communicate a complicated idea (he taught me how iPhone’s ability to track movement across a 3-D plane worked). It wasn’t really entertaining but from the way he spoke, I learned so much and I actually changed the way that I thought because of him. I have found that you need to know your stuff pretty well to be able to explain it so that everyone can easily understand it. Sounds like you found one of those people.